Getting ready to split some thread! 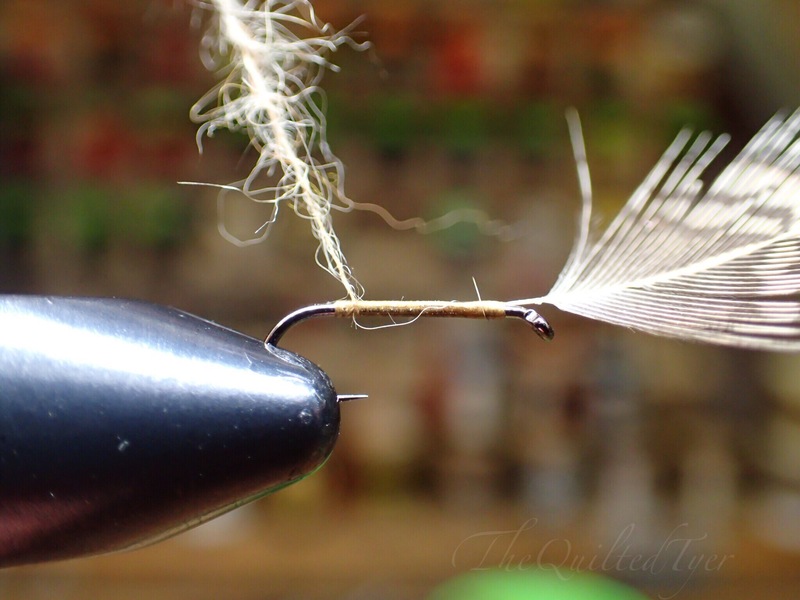 The Split thread dubbing technique can be used when you don’t want to add extra bulk to your fly. 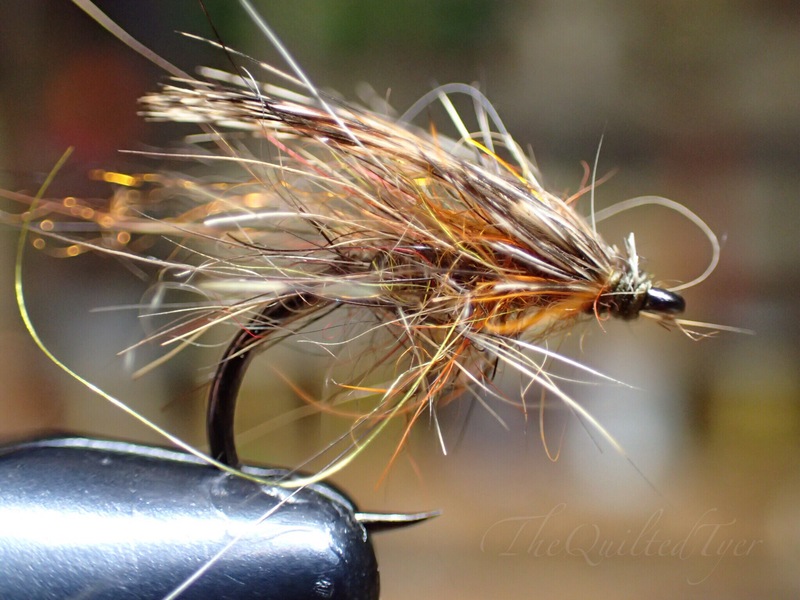 It also works well when you are applying material to the head of a fly such as a hackle collar. Keep in mind that all threads are not good for splitting. Here I am using a Danville thread which works just fine. 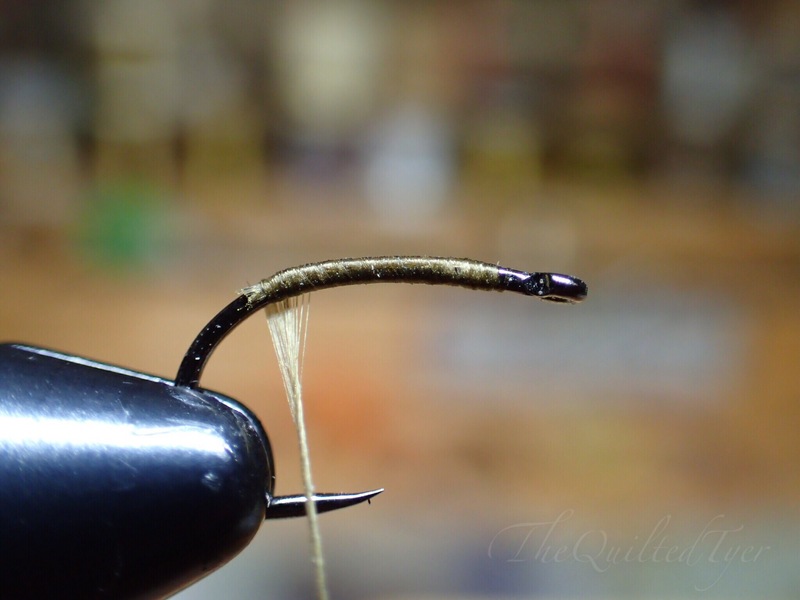 This technique can be used for many different patterns, large or small, and the way you put the dubbing on will change the outcome. What it is doing is relaxing, and untwisting itself. Once you see which way it is going you can give it a little spin to help it along. 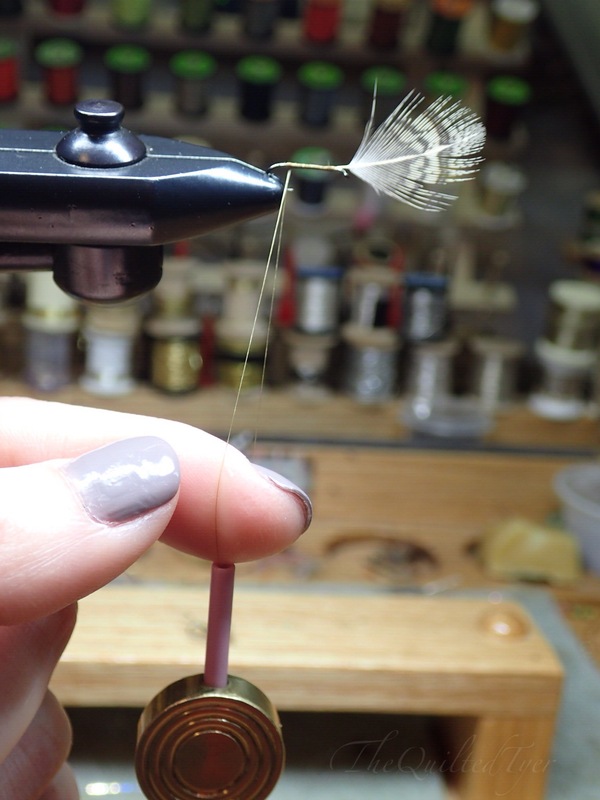 Once you have stopped your thread in the area where you want to start your dubbed body, let the bobbin hang down for a second, and you will start to see it spin. Grasp the bobbin and give it a little spin in the same direction that its looking to go (counter clockwise) until it untwists itself. 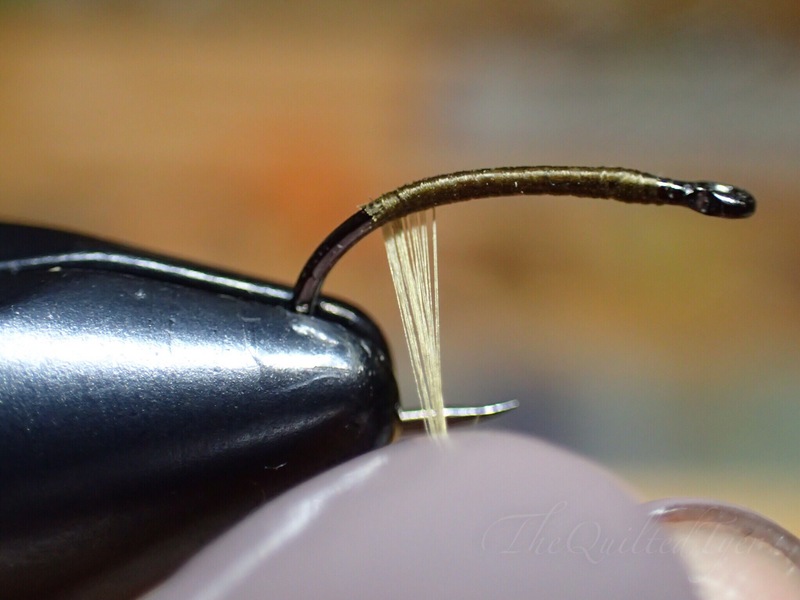 Flat thread is great for splitting, and as you can see here with a little untwisting it starts to flatten out. 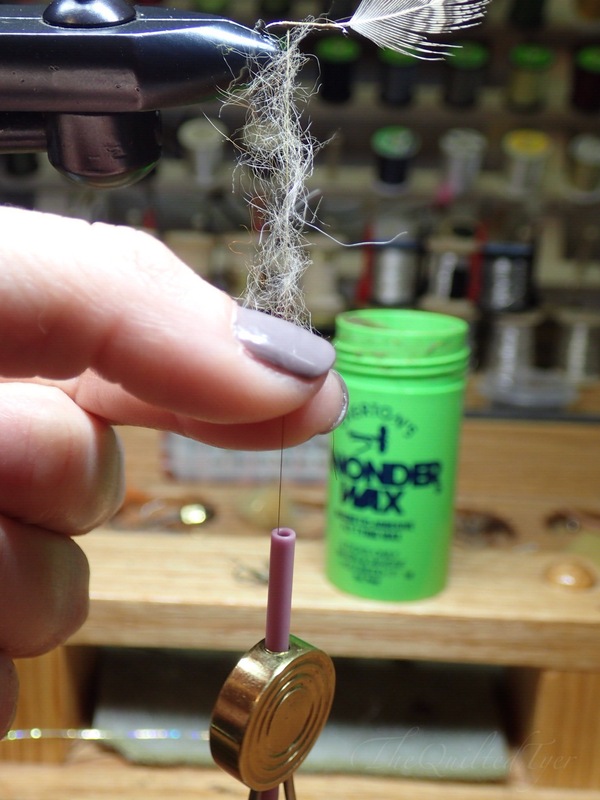 Run your fingernail down the strands towards the bobbin to smooth out the strands. 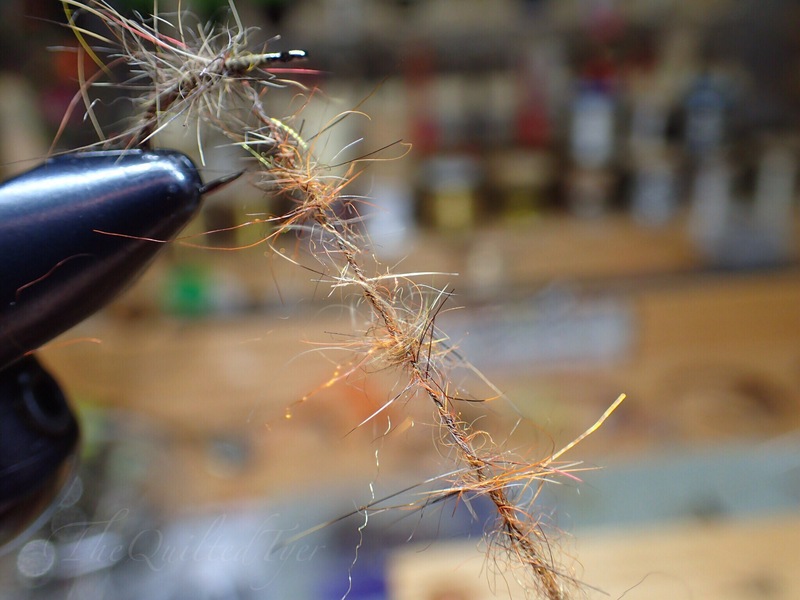 Now that these strands are flattened out, you can get ready to split. Take your bodkin and insert it into the thread. 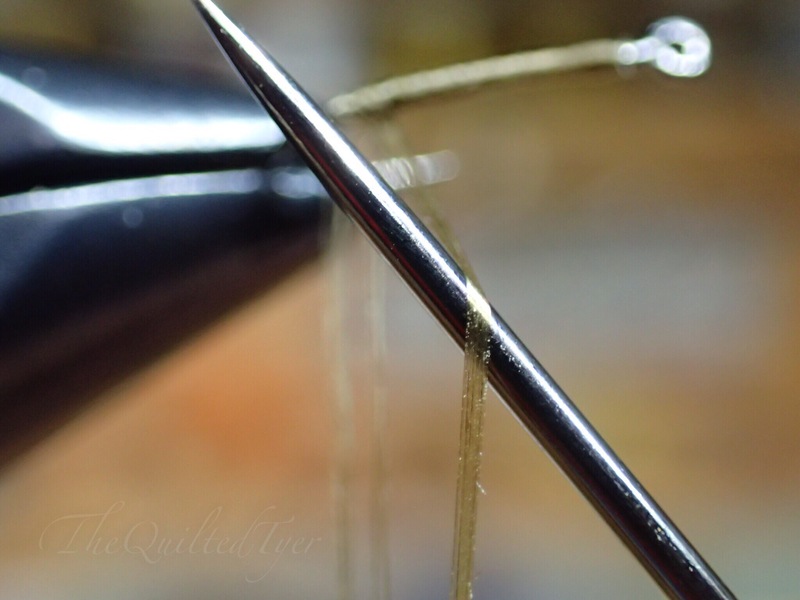 While holding your thread in one hand insert the point of your bodkin into the middle of the strands, then slide your bodkin down to separate. Now slide the bodkin down closer towards the bobbin. 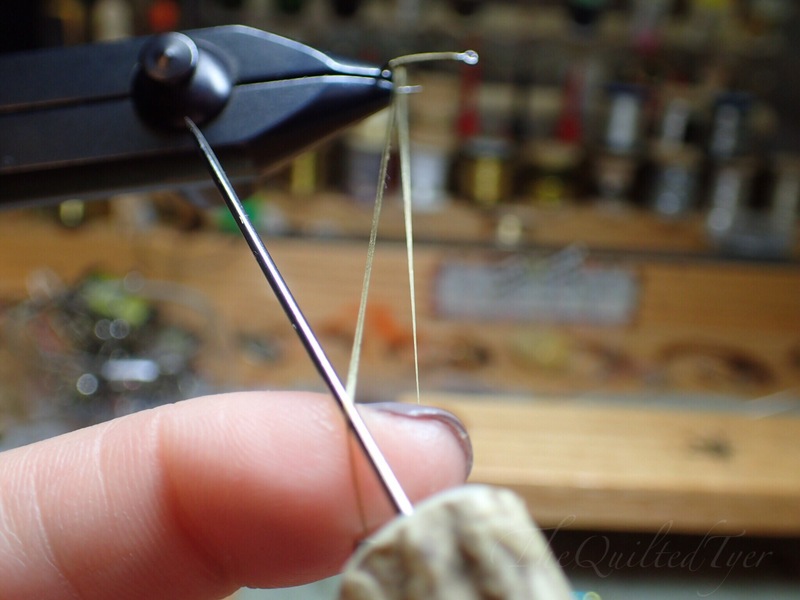 Once you have slid the bodkin down a few inches, remove it and replace it with your pointer finger to keep the thread loop open. With the loop open, its time to add some dubbing. Hold open the dubbing loop with one hand, and add a pinch of dubbing. There are different ways you can dub this loop. 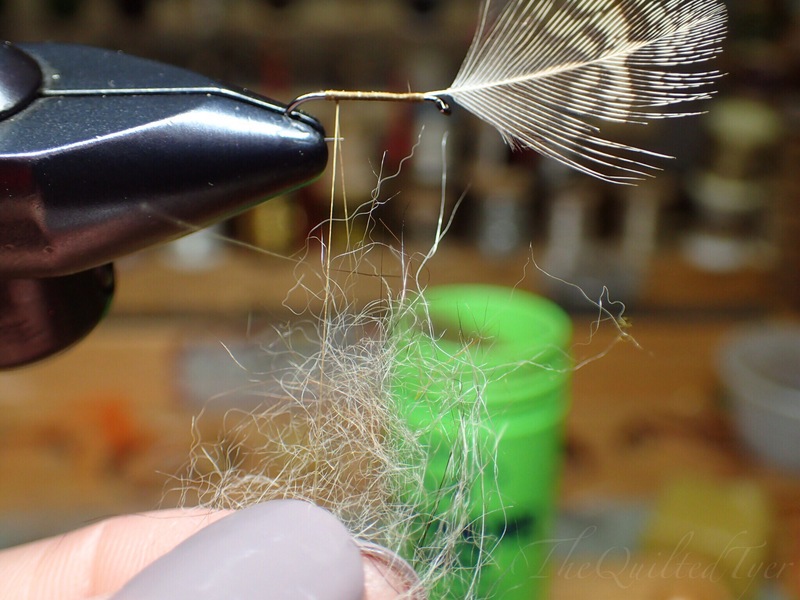 Either create a dubbing noodle where you directly twist the dubbing onto the thread, a touch dubbing method where you use a little bit of wax, but for demonstration purposes; we are going to flatten out a little rabbit dubbing. 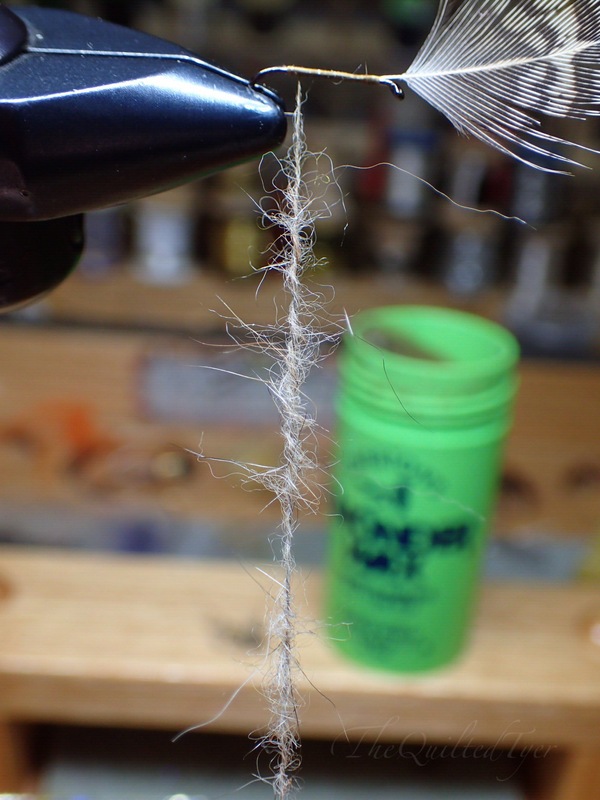 Insert a pinch of rabbit dubbing into the split thread. 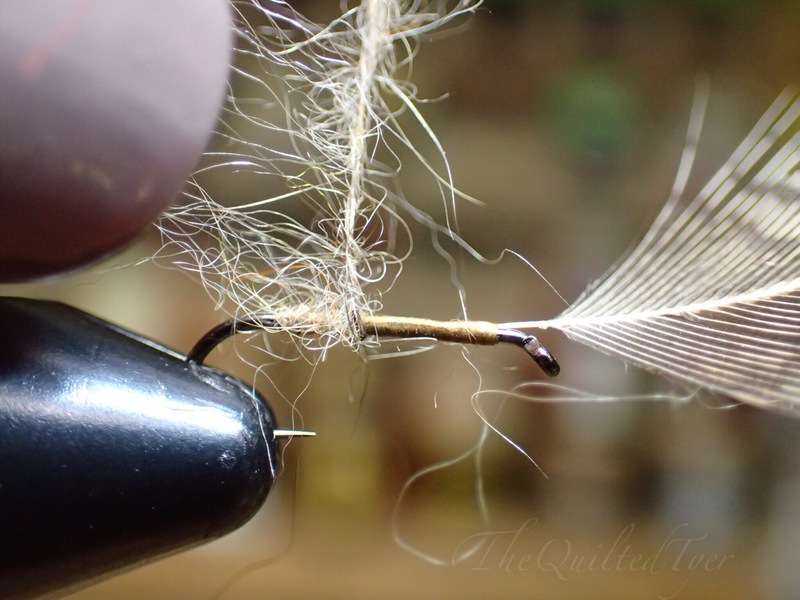 With your pointer finger still holding open the loop, take a pinch of rabbit dubbing and place it in between the two strands of split thread. Now take your thumb on the same hand and pinch the loop closed. I know it sounds complicated but its a lot easier than you think, because essentially what you are doing is you are holding the dubbing in-between the (now closed) loop. 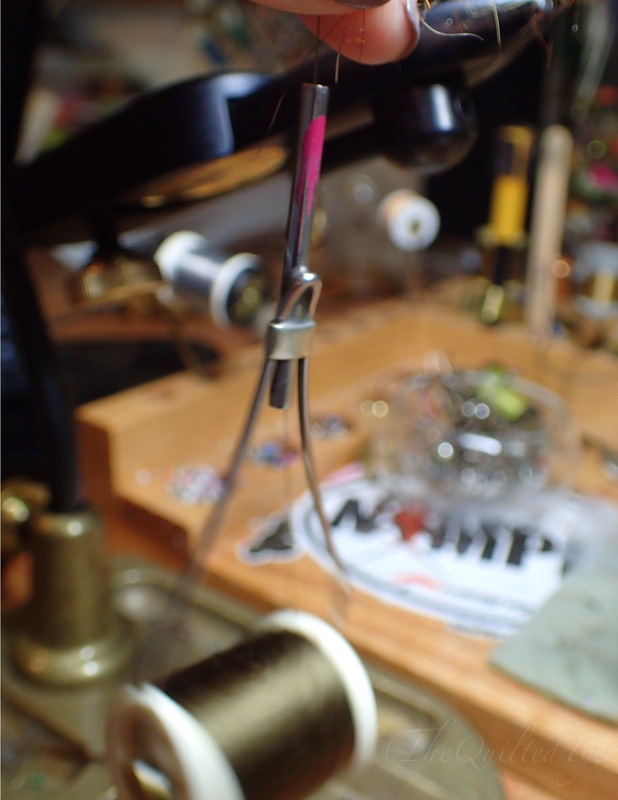 With the loop closed, slide the dubbing up towards the hook and if you find you have a gap, add a little more dubbing. It doesn’t have to be full, you just want enough so that when you twist it it fills out. 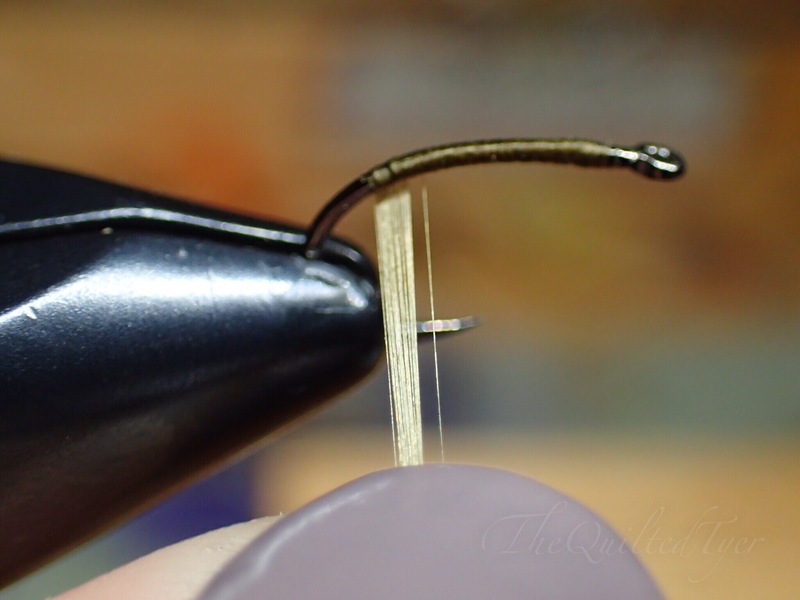 Once you have the dubbing loaded between the open split in the thread, take your two fingers and move them to the outside of the loop. Grasp tightly right at the base of the thread. This will hold everything closed. 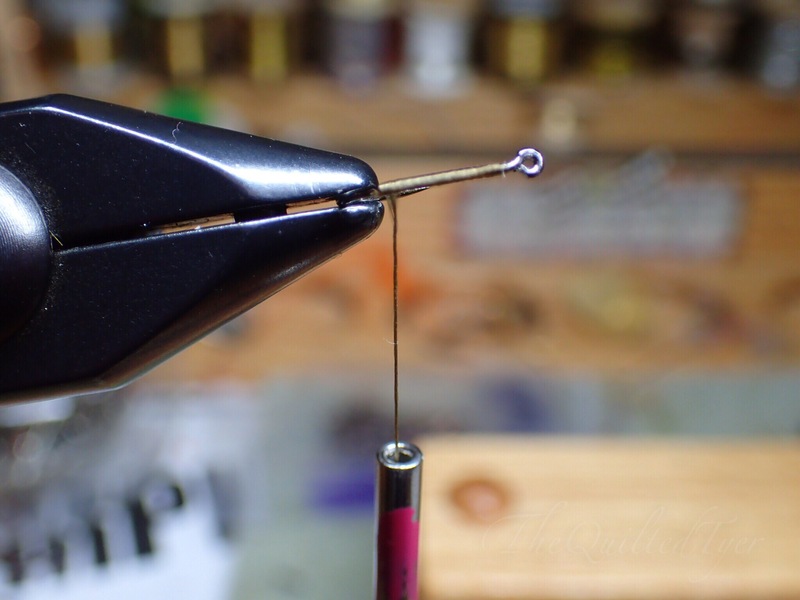 Keep them holding, right towards the tip of the bobbin. Hold that the thread loop tightly! Hold the thread loop closed tightly one hand. Now give the bobbin a good counter clockwise spin. But don’t let go yet! Giving the bobbin a spin will twist the dubbing into a rope. Once the bobbin starts to slow down.. you can let go. Then grab the bobbin to stop it. 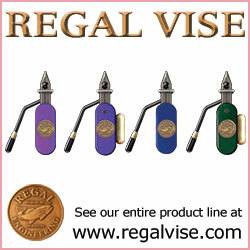 Take a look at your thread loop now. 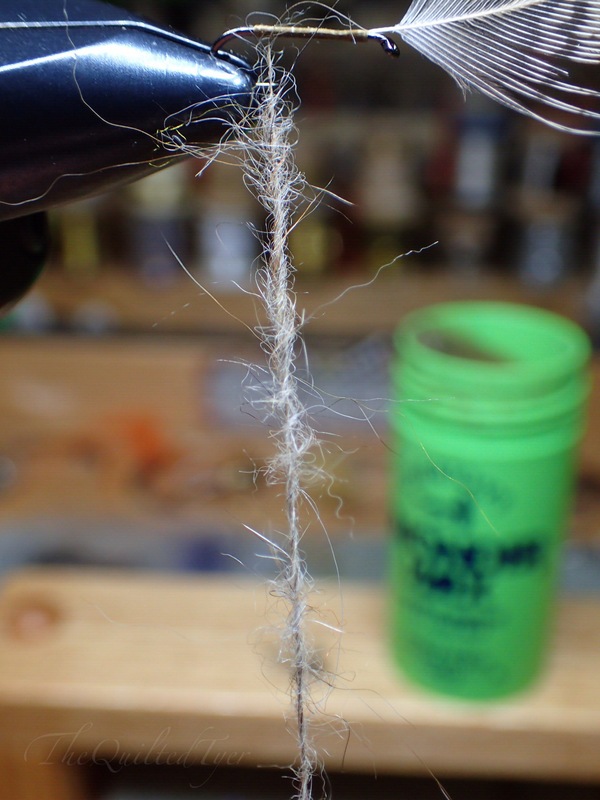 What’s happening here is the thread is spinning and twisting that dubbing between the two strands that you split. Don’t worry if it doesn’t look twisted enough, all you have to do is add tension again and spin it one more time. Repeat the tension and twist until its pulling together tightly. 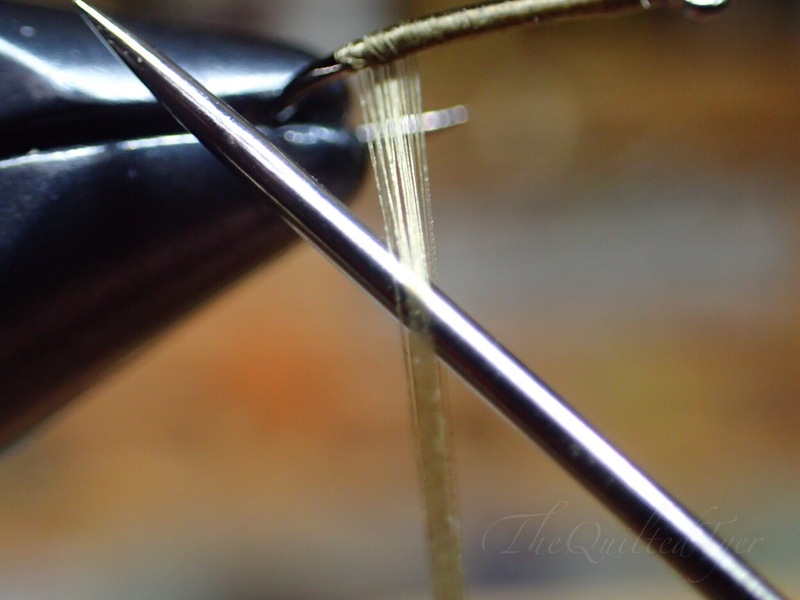 Once you have gotten the dubbing loop finished, grasp it by the end and cut the bobbin loose. 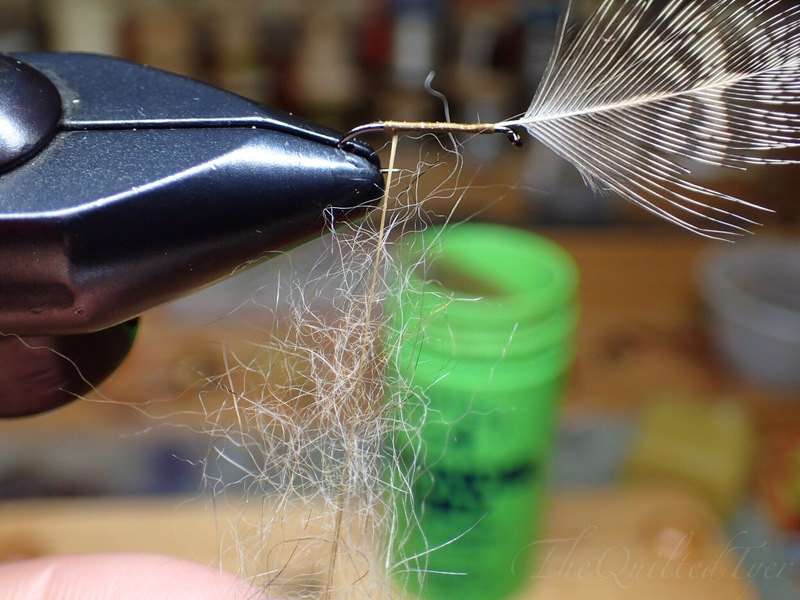 Now you can either use your hackle pliers or fingers to wrap the dubbing loop forward just as if you were wrapping thread. 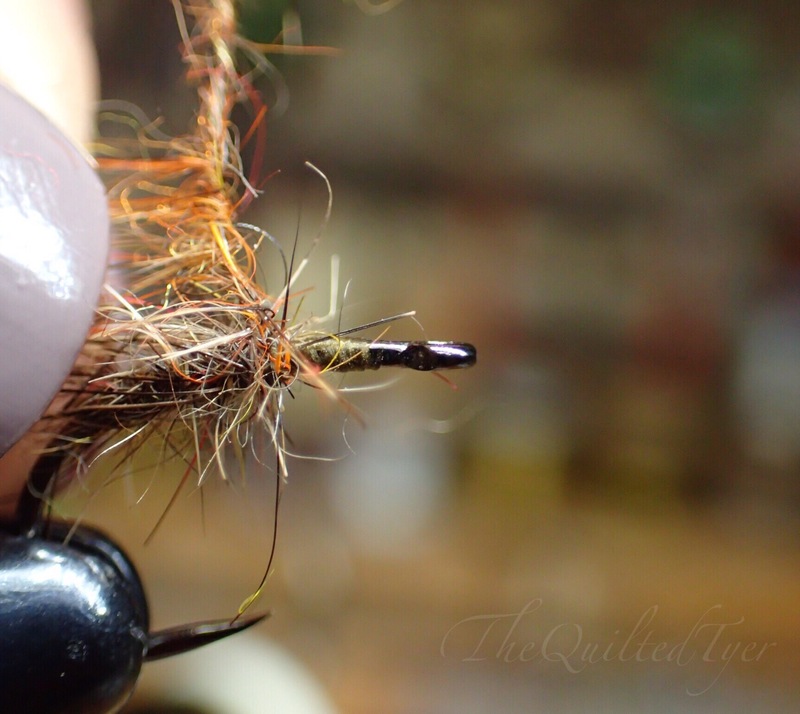 With the loop grasped in your fingers or hackle pliers begin to wrap it forward. 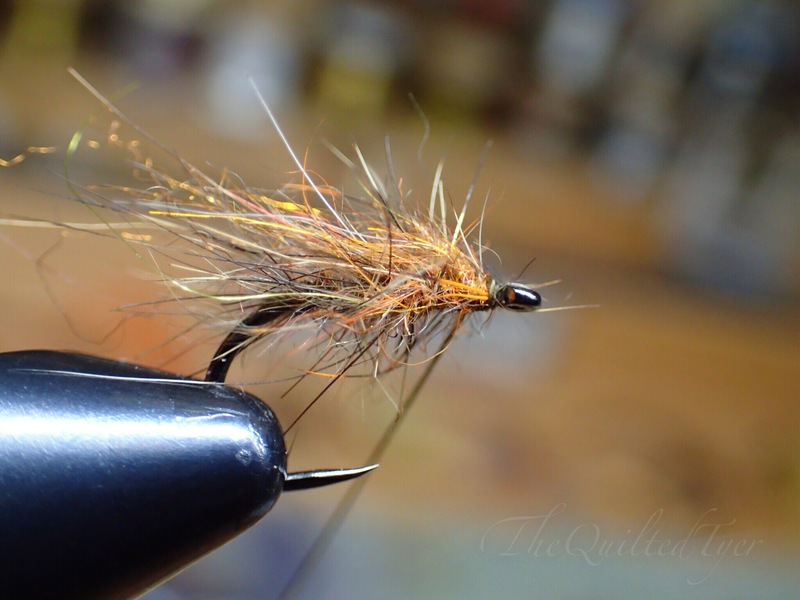 Keep wrapping the dubbed loop forward, brushing back if needed. 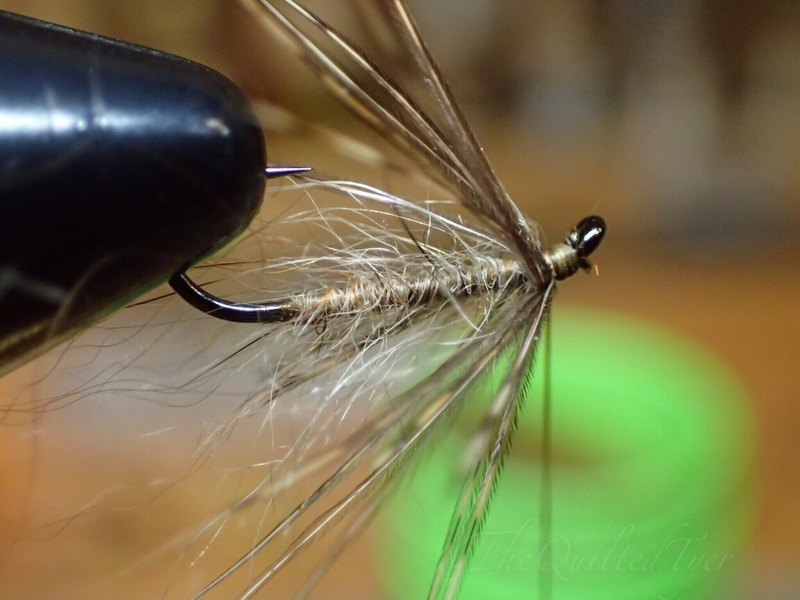 Once you reach the stopping point you can tie off your material and, continue with your pattern. 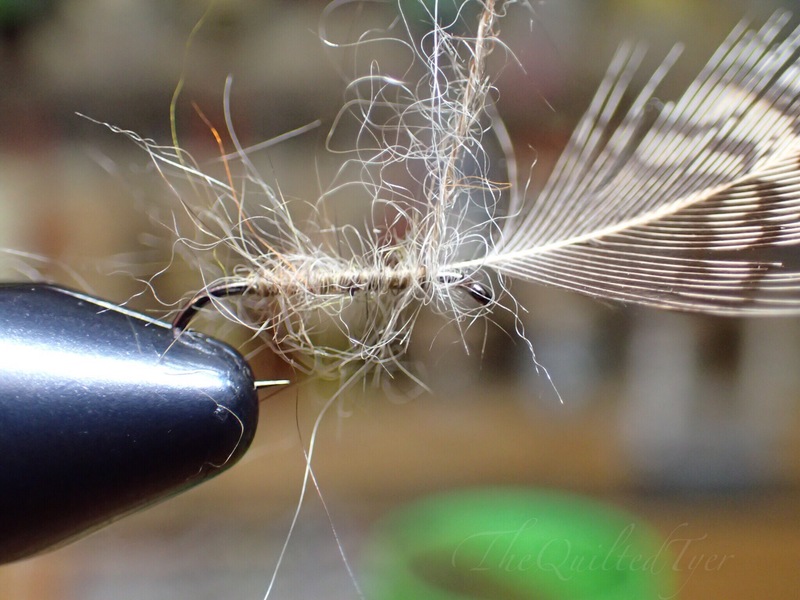 Split loop dubbed soft hackle. 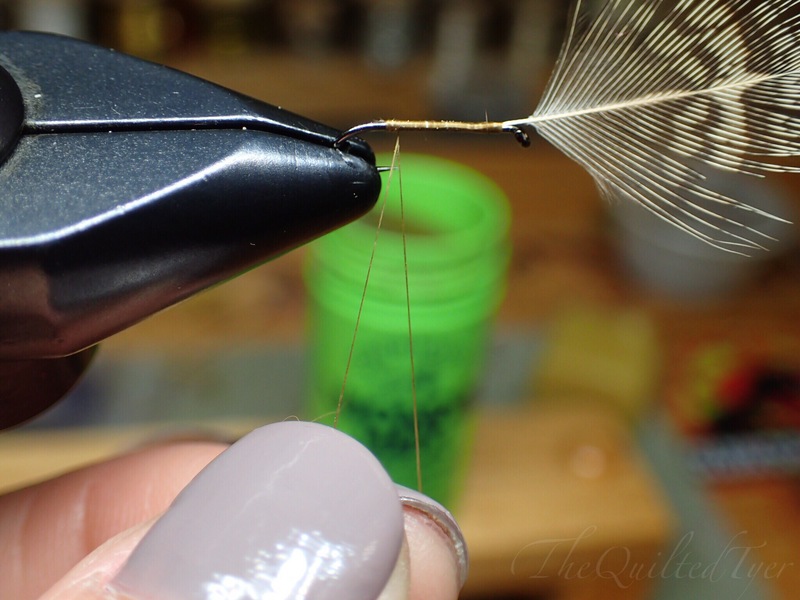 What I like about split thread is sometimes I find myself tying the entire fly by splitting the thread, I will do one color for the body, one for the thorax and even split the thread for the hackle fibers. 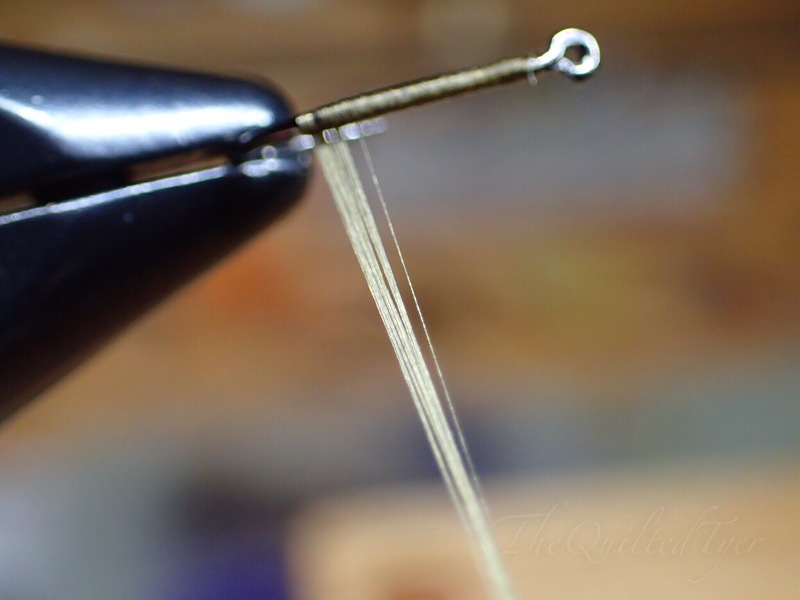 Once you finish one color, simply flatten and split your thread again. This time adding a different color or material. Wrap it and brush back. A mix of dubbing colors. As you can see the possibilities are endless, so dont be afraid to experiment.